Severe aplastic anaemia is a condition that occurs when the body stops producing enough new blood cells. It is a rare and serious condition which can develop at any age. It can progress slowly over weeks or months or may occur suddenly. It results due to the failure of the bone marrow to produce sufficient quantity of red blood cells, white blood cells and platelets. WHAT ARE THE CAUSES OF SEVERE APLASTIC ANAEMIA? Bone marrow is a red, spongy material inside the bones that produces stem cells which give rise to other cells. It occurs when damage occurs to the bone marrow which results in shutting or slowing down of new blood cells. 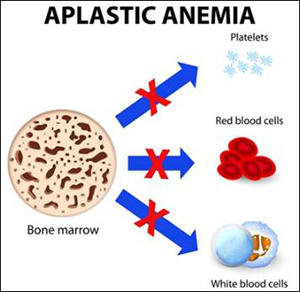 In aplastic anaemia, the bone marrow is described as aplastic or hypoplastic which means that it is empty (aplastic) or contains very few blood cells (hypoplastic). Use of certain drugs such as those used to treat rheumatoid arthritis and some antibiotics. Exposure to toxic chemicals such as those used in pesticides and insecticides. This type of anaemia may get better on its own if exposure to these chemicals can be avoided. Viral infections like hepatitis, HIV, cytomegalovirus etc. WHAT ARE THE SYMPTOMS OF SEVERE APLASTIC ANAEMIA? Modern treatment for severe aplastic anaemia includes medication and blood transfusion but blood transfusion is not a cure for aplastic anaemia but it only relieves the symptoms by providing blood cells that the bone marrow is not producing. Blood transfusion only raises the red blood cell count and transfusion of platelet helps in preventing excessive bleeding. Stem cell transplant is the other treatment for severe aplastic anaemia but it is not always successful. In contrast Ayurvedic treatment helps in stimulating the healthy portion of the bone marrow to improve cell production and is also beneficial in countering side-effects that are associated with conventional therapy. Herbal remedies help in balancing disturbed immunity that is the root cause of this serious disease the chances of relapse significantly diminish with Ayurvedic treatment as Ayurveda works on the root cause of the disease. This disease which is currently considered incurable and has high mortality rate can be treated quite successfully with Ayurvedic herbal remedies. Planet Ayurveda offers effective treatment for this rare disease also. Ashwagandha Capsules of Planet Ayurveda are pure herbal capsules useful in various disorders like fatigue, stress, anxiety, nervous breakdown, weight loss and many other disorders. It also enhances stamina both at mental and physical level. It is a very good remedy for severe aplastic anaemia as it helps in relieving fatigue associated with it. Punarnava Mandoor are classical Ayurvedic tablets to improve blood count, improve blood quality, remove toxins from the blood and helps in eliminating toxins from the body. It is a classical Ayurvedic formulation for anaemia. Thus, it is a natural remedy for anaemia. Giloy is considered as an excellent blood purifier. Moreover, giloy is considered as an excellent immune-modulator thus helps in increasing white blood cells in the body. Giloy capsules of Planet Ayurveda are prepared from pure herbal extract obtained from Tinospora cordifolia. It is also used in the treatment of chronic fever, gout, anaemia, jaundice, cardiac debility and all types of cancers. 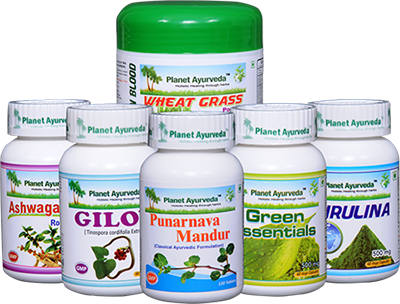 Planet Ayurveda Giloy Capsules are 100% pure and natural. They are free from chemicals and adverse side effects. Herbal medicines like green essentials is one of the most effective and inexpensive herbal remedies which is gaining popularity among the people of both urban and rural areas. Green essential capsules prepared from Planet Ayurveda are prepared from wonderful herbal extracts of wheat grass, spirulina, green tea etc. These capsules nourish the cells and fight against health ailments. These are also known to clear heavy metals which is one of the causes of severe aplastic anaemia. They are also a rich source of minerals and iron which are responsible for blood formation. Wheat Grass Powder of Planet Ayurveda is obtained from dried powder of young wheat (Triticum aestivum) plant. It contains wheat grass powder which is naturally dried. It contains over 90 minerals and it is well known for increasing red blood cells. Dosage: Mix a tablespoon of powder in plain water, stir well and drink instantly empty stomach in the morning. Spirulina (Arthrospira platensis) is a blue green algae (cyanobacterium) Planet Ayurveda’s Spirulina capsules are of high nutritional value. Planet Ayurveda Spirulina capsules contain standardised extract of high nutritional value spirulina rather than only raw powder. It contains potassium, calcium, copper and iron elements and pigment such as beta-carotene is beneficial in increasing red blood cells and spirulina is also known to increase platelets in the blood. These herbal remedies have a powerful effect on the bone marrow and stimulate it to start to produce normal red blood cells. The advantage of taking herbal treatment for severe aplastic anaemia is that the individuals do not require blood transfusions after about 3-4 months of commencing Ayurvedic treatment. Eat a variety of vegetables, whole grains, legumes, fruits etc. foods which are rich in vitamins, minerals as well as fibre should be consumed. Eat relatively unprocessed grains and legumes with every meal. Avoid the consumption of refined and starchy foods, salt preserved foods and limit the consumption of sodium in the diet of Severe aplastic anaemia. Avoid eating outside as there are chances of infection.